At first, I did not see my result, my sister called me and said that I got 195 marks which I thought was a joke. But later she made me believe about my CPT success. I did not expect this much honestly. After that, I called my parents and everyone was very happy. Q How many marks were you expecting? I was expecting 192 out of 200. Q What seems to be one of the important factors behind your success and the marks you have achieved? Most importantly, VSI study plan. The study structure at VSI, created by VSI director R.C. Sharma, help us a lot... that includes 5-6 hours of morning classes and daily 5-6 hour of regular study at home. And their mock test plan was basically very helpful for me. so I consider it an important reason in my success. Actually, in our first mock test paper, We all got poor marks. Because we didn't know the exam pattern and how to appear in the exam. Next day R.C. Sharma explained to us how we should appear in the exam? and where we were lacking and how we should workout on our problems. I followed their path. And gradually I started getting better marks. Apart from VSI notes, did you refer other books? No, I never felt. Their material is best and so enough that I did not feel to use any reference book and other. 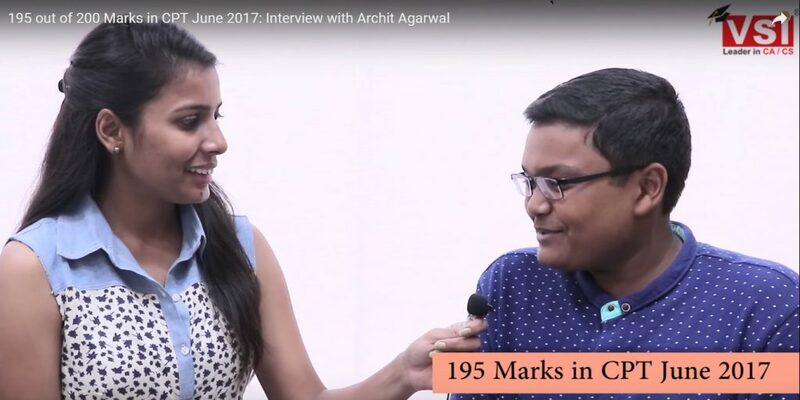 Student Also Read: Why you need coaching to clear CA Foundation examination. Q We all feel stressed and weak at some particular moments during preparation then who motivated you that time? Obviously, everybody feels stress. We can't study all the time, it is not possible. so Mainly, I used to see movies once in 2-3 weeks to become stress-free. Q Whom you want to give credit for my success? I want to give credit to VSI because as I mentioned earlier, the pattern here was very good. Q What are your planning regarding CA Intermediate 2018? For the preparation of ca intermediate, I have just joined VSI because it's previous years IPCC All India records are very promising. Like, 2 years ago, Tanu and Gunjan di got AIR 1 and AIR 2, If you will see the records then VSI has always produced top rankers. Especially, VSI has grown up a lot in recently 3-4 years. That's why I already joined VSI. Q You did not wait for CPT Result? No, If I would have waited for CPT result, then I could spoil my 1 months. And I don't want that. So to get the benefit of that one month I joined VSI very early batch. QIf you talk about your self-study then how much do you do? Self-study is very important. As if there were 5 to 6 hours of daily classes, then you had to go home and gave each subject at least 1 hour because there was homework and also previously piled up the course for revision. So, accordingly, minimum 6 hours for preparation at home after coaching. Student Also Read: How Can An Average Student Crack CA Foundation Examination. Q What are those important points during the preparation, that your juniors should pay attention to? I will say this only, that the VSI notes are the best.Also, It covers everything that you will find in all other books or scanners etc. Also, referring other stuff could be misleading because there are mistakes in question and answers in outside reference books and even in ICAI modules. But VSI always provides updated and more than sufficient study material. Q What message would you like to give to the students who are preparing for CPT? Be self-confidence and be consistent in your studies, then your result will be 100% good. And focus more on the mock test papers because it helps you a lot. Q What is your goal for CA intermediate? In our Sure Success batch, we are students from all over India, we are all working hard to get good ranks in ca intermediate exams.